In the beginning, September 2012, I had symptoms that resembled neuropathy. In the late morning, I had a discomfort in the balls of my feet which lasted as long as I was on my feet. Neurology tests diagnosed peripheral neuropathy. After a few months the pain increased beyond any definition of neuropathy. Within an hour of wearing shoes and socks, the pain was unbearable. Removing the shoes would partially relieve the pain, but removing the socks was the only way to totally relieve the pain. The first two Neurologists recommended that I look for an underlying cause of the pain. I saw three Podiatrists, 3 Neurologists, an Orthopedic Surgeon, a Physical Therapist, a Chiropractor and an Acupuncturist. After many drugs and tests, it was finally diagnosed as Diabetic Neuropathy. September 2012, I was borderline Diabetic and A1C was 6.0, but climbing as time when on. March 2014, the A1C reached 6.7 and we started Metformin and Victoza to reduce Blood Sugar. The A1C was 6.3 in June and we are waiting for the latest results now. The latest Neurologist, From Pennsylvania University Medical, Philadelphia, PA, said that she has seen patients with the same pain and were also borderline Diabetic. The only way she has seen to relieve this pain is to lower the Blood Sugar. I somewhat agree with the neurologist in that the higher your blood sugars the worst your neuropathy in the sense that if you continue to have elevated blood sugars, your neuropathy will worsen. However, the other part of the equation that if you lower your blood sugars, your neuropathy will improve, is not necessarily true. Unfortunately, once the nerve lining is damaged from elevated blood sugars, although there can be repair to the nerve it will take a very long time. The one part of your narrative that bothers me is where you state originally your pain would worsen the more you were on your feet. I am sure you have been tested for it but tarsal tunnel comes to mind. I say this for a couple of reasons. In general, people who have a tendency towards tarsal tunnel tend to be flat footed (pronated). 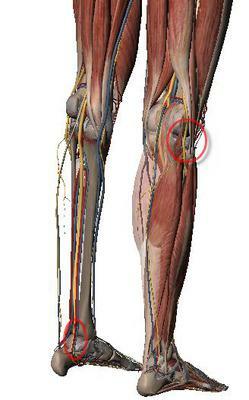 It is this pronation that "squeezes" the nerves on the inside of the ankle resulting in your symptoms. So, the more you walk, the more you pronate, the more pressure you put on the tibial nerve, the more pain you get on the ball of your feet. if the nerve sheath is damaged, you will get your symptoms regardless of whether you are standing, walking, or sitting. Most diabetics with severe neuropathy have unremitting pain; it is constant. What this means to me is that all things being equal you could be having tarsal tunnel symptoms or symptoms from the head of the fibula bone simply because your nerves happen to be a little bit "thicker". Carpal tunnel which is essentially tarsal tunnel of the wrist has a higher incidence in diabetics, simply for the reasons I just stated. You have been to many doctors and I would like to think one of them thought along these lines. If not, you might suggest to one of them, the possibility of this type of "nerve irritation" causing your neuropathy. If it turns out that you are experiencing this type of issue then measures can be taken to address them directly and they may go along way to reducing your symptoms, along with you controlling your blood sugars. You mention you have taken drugs as I suppose to try and lessen the symptoms, but you do not mention what kind of response you have had. If taking these drugs is not something you look forward to simply because of their potential side effects, you can also look into supplements such as alpha lipoic acid or acetyl-l-carnitine both of which have shown the ability to reduce neuropathic symptoms with the one caveat that you will have to take one or the other for at least three months before you see any improvement. Lastly, my discussion would not be complete if I did not mention the possibility of Morton's neuroma which is another nerve entrapment that occurs in the ball of the foot. Again, if your symptoms are only occurring in the ball of the foot (the pain can travel forward into the toes or back into the foot) and the pain worsens the more you walk, then this condition also has to be ruled out. I would think however, after seeing three podiatrists, one of them would have ruled out Morton's neuroma. See my article on peripheral neuropathy.